A mother has claimed that her two year old son was knocked unconscious by a police volunteer wielding a truncheon last night. The parents of the child were going out to eat in Soi Khao Talo, Pattaya, when they saw a police checkpoint and doubled back on their motorcycle to avoid a fine. Kanya Tomklang, 25, said that a man dressed in black jumped out of the shadows and attacked them hitting her son Sila Ninkham or "Sam" aged just two. She said that the man was still not satisfied with what he had done - he raised his baton to strike again as the husband and father kicked out to prevent further injury. The family managed to get away. 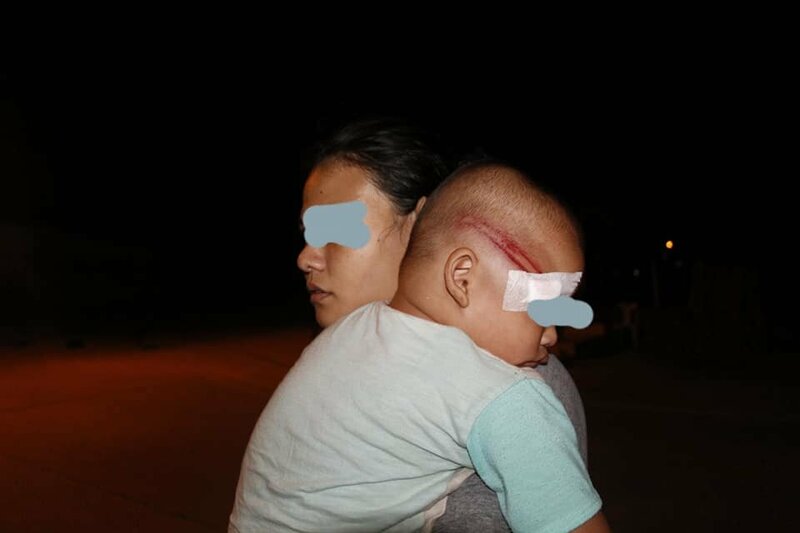 They rushed to a clinic but finding it close made their way to Bang Lamung Hospital where the child was given three stitches to a serious head wound. 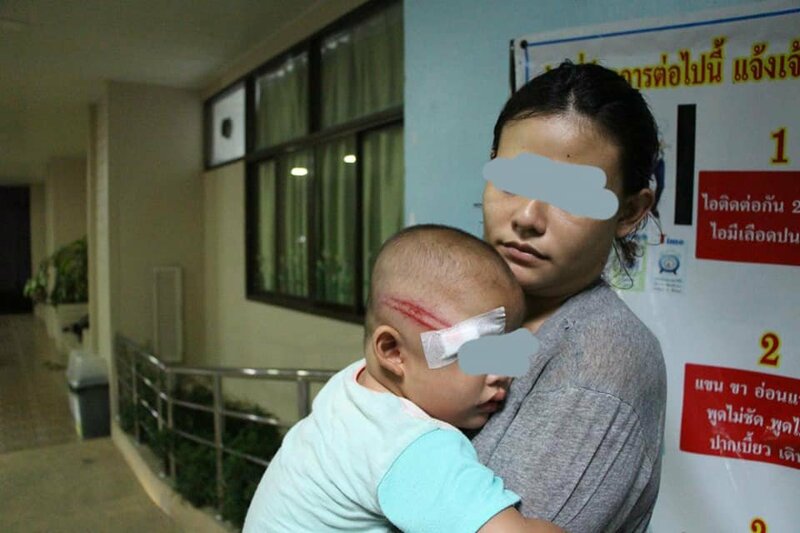 As The Pattaya News reporters spoke to the mother the child began vomiting and was transferred to another hospital for more urgent treatment. The mother had said: "We just wanted to avoid a fine - is it that serious that it warrants this?" Posters on the news site on Facebook urged the family to go to the government watchdog Damrongtham for justice. One poster who called the police "dogs" had more than 100 likes. The story was widely shared. More about this incident as we hear of it. Sad. Pattaya is out of control with check stops and the revenue they bring. Black uniform? jumped out of the shadows? Either a fake cop or a fake story. It's quite normal. Usually without a shave for days too. And they do give a chase. I have never been truncheoned though. If you ever imagined what a highway bandit might look like? I have seen disgraceful tactics employed by the cops to get someone to stop, with no thought whatsoever for the potential injury or death such stupidity can cause. And for what? 99% of the time, it is simply a bit of extra tea money. I hope the dirtbag that did this is found and publicly crucified. Smashing a baby in the head with a truncheon is just not acceptable in the slightest, regardless of why mum and dad wanted to avoid the stop. Usually the goal, when Thai cops deal with fleeers, is to knock the bike over. They often do this by kicking them off. Volunteers are even worse as they are totally untrained, eager to prove themselves and younger and more impetuous. Fleeing a checkpoint is a risky business. You have escalated the issue with the police. Thai police are irresponsible and unaccountable so if you choose to escalate with them, you are taking a big risk. Notice how the husband continued to escalate further by fighting with the police and then fleeing for a second time. You cannot count on the Thai police to be concerned about your safety. I agree with virtually everything you say with one exception. The father started fighting with the volunteer cop to prevent him causing further injury to his child. When your child is in danger, the overriding priority is to protect and to me the father is quite correct to do what he did. In fact I would go so far as to say the cop was lucky that he didn't get beaten to death for striking and seriously injuring a baby. The guy claiming the cops are dogs cettainly has a point. This is an appalling crime regardless of who committed it. Never seen one on the Darkside, particularly at a traffic stop. Never seen a cop with a truncheon either. The ThaiVisa News Team gathers and disseminates news bulletins from Thai and International sources, and republishes them in the News Forums for our members' information and enjoyment. Our News Team works hard to bring quality content to the News Forums, and should be respected for their efforts. Comments such as "slow news day" or "clickbait headline" are neither respectful nor welcome on the forum, and will be considered as troll comments and removed and the offending poster warned and/or suspended accordingly. This inhumen beast won't be found and even if, the outcome would be he made nothing wrong. Because "police" never can do something wrong. The more I think about the more I doubt letting my son grow up in this shithole country. So she was breaking the law and tried to dodge a police checkpoint to avoid a fine. The police shouldn't have attacked her, but she should take more responsibility on the road. How did the truncheon manage to do that amount of damage to a 2yr old through a helmet?? ?